Formed in 1982 by the merger of Connecticut General Life Insurance and the Insurance Company of North America, CIGNA had expanded steadily through internal growth and acquisition. The company faced two key branding issues. First, could the CIGNA brand stretch to encompass an array of services that ranged from reinsurance and property and casualty to investment services and healthcare? 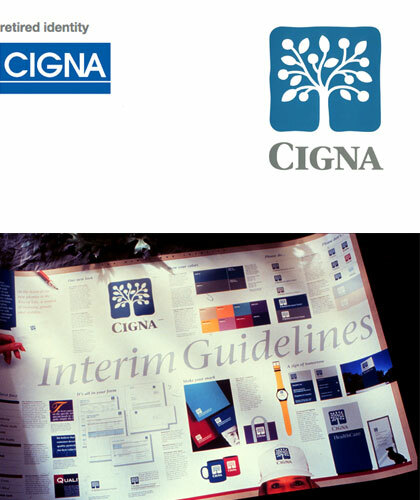 Second, how well did the existing CIGNA identity serve the company’s desired brand image? The “Tree of Life” identity and the slogan “A Business of Caring” enhances CIGNA’s image as thoughtful, caring and responsive while maintaining existing attributes of professionalism, stability and strength. A better understood nomenclature system and the simplification of thousands of company forms helps broaden audience appreciation of a diverse, full service, customer-focused organization.